Between weddings and vacations, summer is the season of travel. We’ve covered our foolproof packing list and editor-approved suitcases, so now we’re turning our attention to the best airport looks courtesy of our favorite celebrities. Below, we’re naming the top ten ladies who consistently kill it in the travel style department—from Miranda Kerr’s signature ladylike outfits to Rihanna’s comfortable hip-hop-inspired look. Scroll down to see who made our list and get inspired for your upcoming travel. On Kerr: Michael Michael Kors bag; Lanvin shoes; Oliver Peoples Eyewear Benedict Photochromic Sunglasses ($425) in Silver. On Rihanna: Acne Studios More Black Leather Jacket ($1850); Giorgio Armani bag; Lucid FC Logo Trucker Hat ($35) in Black and White. On Chung: Saint Laurent Cotton-Blend Velvet Blazer ($2990); Louis Vuitton bag. On Kruger: Comme des Garçons shirt; Matisse x Kate Bosworth Charlotte Boots ($482). On Beckham: R13 The Alison Mid Rise Ankle Skinny Jeans ($325); Alaïa Boots ($380). On Jenner: Rails Carter Dark Vintage Denim ($138); Mother Stunner Ankle Fray Jeans ($196); Givenchy bag; Puma Match Lo-Basic Sport Leather Sneakers ($65). On Alba: Krisa Double Layer Cami ($106); Louis Vuitton Soft Lockit MM Tote ($3200); Jenni Kane shoes. On Clooney: Oscar de la Renta dress; Dolce & Gabbana bag; Jimmy Choo Anouk Suede Pumps ($595) in Black; Prada sunglasses. On Huntington-Whiteley: Saint Laurent Leather Biker Jacket ($4990); Saint Laurent shirt; Paige Denim Verdugo Crop Skinny Jeans ($158) in Black; Givenchy Lucrezia Mini Leather Bowling Bag ($2250); Saint Laurent shoes; Ray-Ban Classic Wayfarer Polarized Sunglasses ($200). 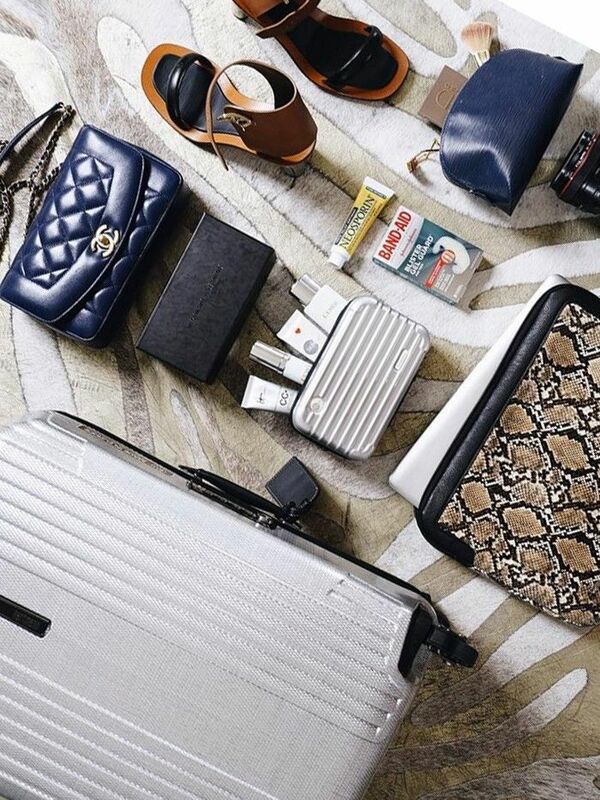 What's the one item you can't get on an airplane without? Headphones? Scarf? Let us know in the comments below!